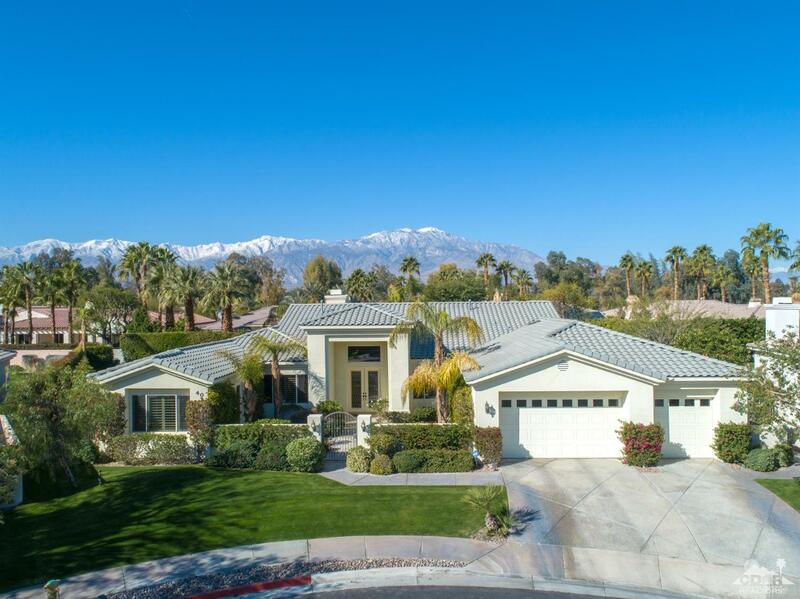 Luxury awaits your arrival in this Rancho Mirage property located in the gated community of Victoria Falls. The Regent floor plan, with an attached casita, offers 4, 355sf, 5 bedrooms, 5.5 bathrooms, an elegant columned entry foyer, glass entry doors, granite kitchen, living room with sunken wet bar and fireplace, dining room, family room with fireplace and built-in cabinetry and built-in sound system. The master suite features a fireplace, huge walk-in closet, soaking tub and direct access to the covered patio. This magnificent home sits on an oversized lot at the end of a cul-de-sac and is entered through a lovely private courtyard with fire water feature and beautiful landscaping. The rear yard is a perfect retreat and is beautifully accented by lush landscaping, custom waterfall and built-in BBQ. The fresh pebble tec salt water pool and elevated spa has been positioned to take advantage of the southern sunshine. This home is sure to provide endless entertainment and enjoyment. Included in Sale: Furnished per seller's inventory.